Samsung Electronics announced today that Brazil will roll out Samsung Pay on July 19, with major financial partners, making it the first market in South America to introduce the company’s mobile payment service. Secure and easy to use, Samsung Pay can be used to make purchases almost anywhere¹ that debit cards or credit cards are accepted. Samsung Pay allows users to pay with their compatible Samsung smartphones at point of sale terminals, thanks to both MST (Magnetic Secure Transmission) and NFC technologies. Brazil joins South Korea, the United States, China, Spain, Singapore, Australia and Puerto Rico in the list of priority markets to launch the mobile payment service. According to research conducted by FEBRABAN (the Federation of Brazilian Banks), mobile banking usage is on the rise in Brazil. In fact, it increased by 138 percent in 2015 with more than 11 billion bank transactions through smartphones, compared to 4.7 billion transactions in 2014. “We are extremely excited that Samsung Pay is now available in Brazil. 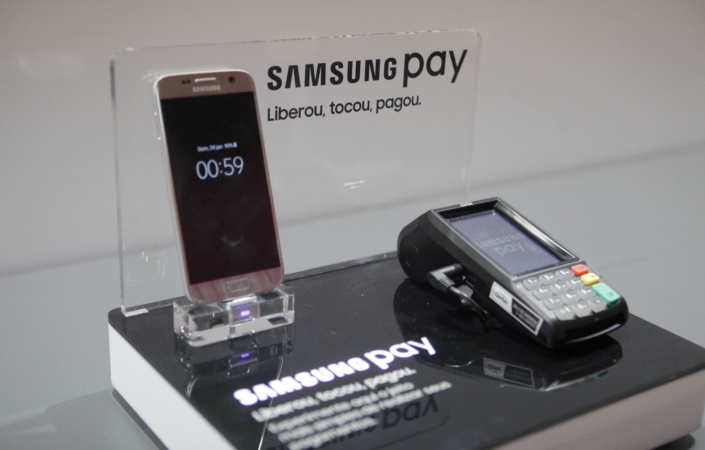 As the first market in South America to roll out our mobile payment service, Brazil will pave the way for the region’s adoption of Samsung Pay,” said André Varga, Product Director of Samsung’s Mobile Devices Division in Brazil. Samsung Pay is strategically expanding its partnership ecosystem to provide greater flexibility, access and choice for customers. Samsung Pay has partnered with major payment networks such as MasterCard and Visa to bring mobile payments to consumers. The service will launch with major issuers including Banco do Brasil, Brasil Pré-Pagos, Caixa, Porto Seguro, and Santander. Additionally, we are working with other bank partners including Banrisul, Bradesco, Nubank and Itaú-Unibanco, to make the service available to more consumers in Brazil. The list of partners eligible to offer this service is available on the website http://www.samsung.com.br/samsungpay. A secure and easy-to-use mobile payment service, Samsung Pay can be used to make purchases almost anywhere that cards are accepted. SIMPLE: To make a payment on Samsung Pay, consumers simply need to swipe up on their compatible Samsung smartphone, scan their fingerprint and make a payment. It’s that easy! SECURE: Samsung Pay uses three levels of security to enable secure payments – fingerprint authentication, tokenization and Samsung KNOX. ALMOST ANYWHERE: Samsung Pay will be compatible with a majority of existing and new payment terminals, allowing users to pay with their compatible Samsung smartphone anywhere that allows payment by swiping or tapping a card with MST and NFC. Samsung Pay will be available on the Galaxy S7, Galaxy S7 edge, Galaxy A5 (2016), Galaxy A7 (2016), Galaxy Note5, Galaxy S6 edge+, Galaxy S62 and Galaxy S6 edge2 beginning on July 19 in Brazil. Samsung Pay, a mobile payment service from Samsung Electronics, is simple, safe and works almost anywhere3 you can swipe or tap your card. Combining NFC with Samsung’s proprietary MST technologies, Samsung Pay provides consumers a way to pay almost anywhere you can swipe or tap a card at millions of merchant locations. Samsung continues to strategically expand its partnership ecosystem for Samsung Pay to provide greater flexibility, access, and choice for customers while enabling an easy and safe payment experience. Samsung Pay is compatible with select cards and Samsung devices, and leading wireless providers. Please visit www.samsung.com/pay to learn more. 1Availability almost anywhere is based on compatibility of Samsung Pay on MST and/or NFC payment terminals, with some supported for use only after software upgrades. Samsung Pay is exclusive to selected Samsung Galaxy smartphones only, and available across all participating payment networks, banks, and merchants. Availability may vary, please check for updates. 2Only with NFC ; MST is not supported. 3Some card reader terminals may require software updates to be compatible with Samsung Pay. Samsung Electronics announced the launch of Samsung pay in the Ibirapuera Auditorium, Sao Paulo, Brazil. 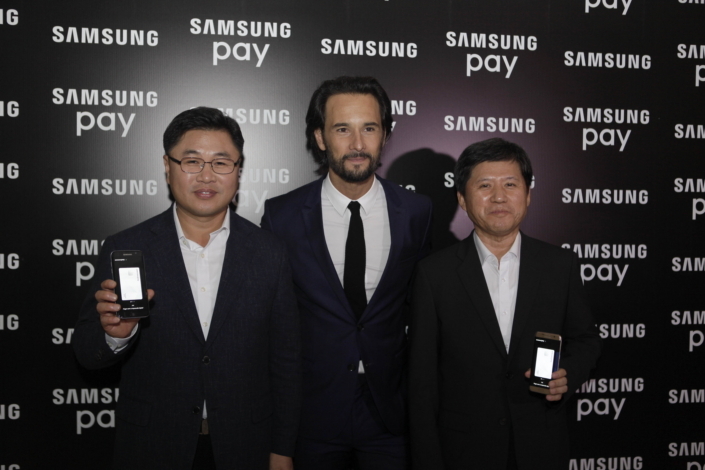 (From left to right) Changhoon Yoon, VP of Samsung Brazil, Brazilian actor Rodrigo Santoro and Jeonghwan Kim President and CEO of Samsung Latin America. 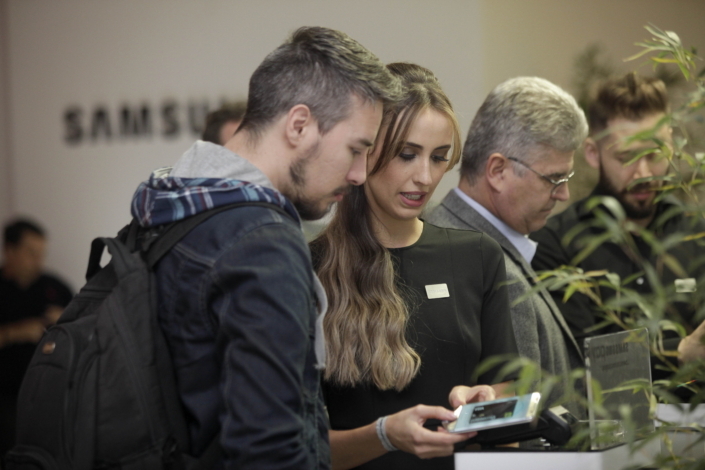 Attandees checks out the Samsung Pay during the launching event in the Ibirapuera Auditorium, Sao Paulo, Brazil.